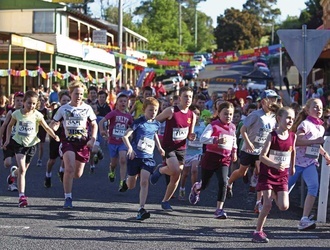 The Carcoar Cup Running Festival is a grand annual challenge on the Australian running calendar. 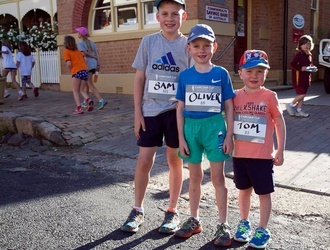 Held the first weekend of November in the historic Central West NSW town of Carcoar, the Carcoar Cup is a fantastic weekend for both runners and family. 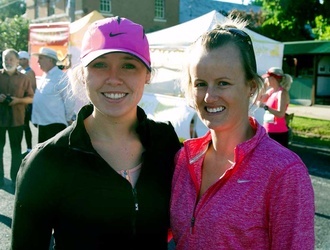 The festival was conceived to bring runners & visitors from all over Australia & overseas to showcase the beauty of Carcoar and the surrounding region. 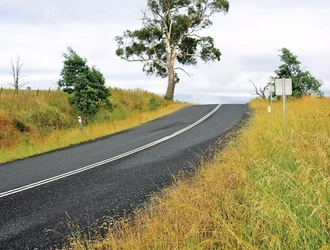 It is run over a course which has been described as one of the toughest and most beautiful in Australia. This is the ultimate family running weekend, with events for all abilities and ages. For a small regional event the prize money is huge – $13,000 – but this is the ultimate family event, with adults tackling the longer events and the children their own special race. There are also many other activities organised around the town over the weekend including exhibitions, displays and stalls. And with so many other attractions available around the region, why not make a weekend – or even an extended holiday – out of your time at the festival this year? 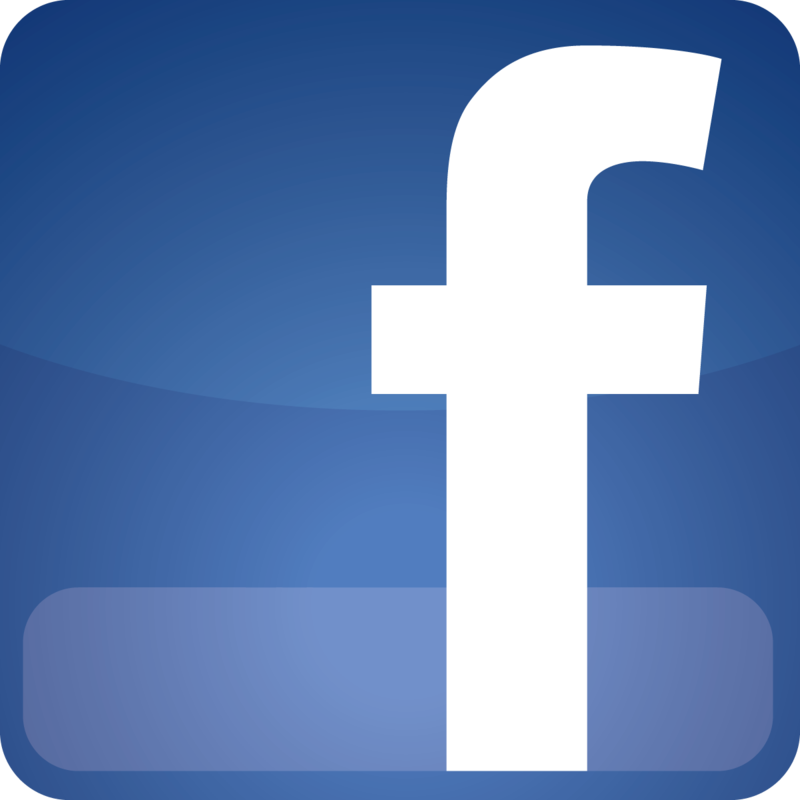 Regular updates about the event will be posted on our Carcoar Cup Facebook Page, so please like to stay in touch. The Carcoar Cup is also the final event in the Optus NSW Regional Distance Running Championships. 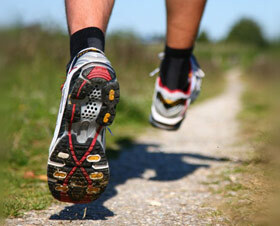 Visit the ONSWDRC website to see how you can continue to grow your running enjoyment! 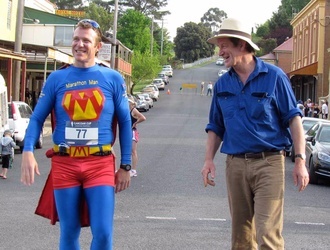 The Ultra Marathon has been added to the original Carcoar Cup events due to popular demand. Runners in the Ultra will follow the same challenging course as the Marathon runners with the addition of a loop after the town of Neville. The hero of the festival, this race is run over the traditional marathon distance (42.2KM) but with a mix of sealed and unsealed surfaces and changes in altitude and scenery along the way. 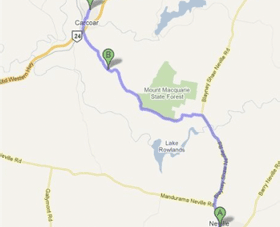 The Carcoar Cup begins in Carcoar, travelling along the Fell Timber Rd and out onto the Mandurama Neville road. Competitors then loop out around the back of Neville before storming down the main street to the cheers of waiting spectators as they cross the half way mark. Runners then make their way along the Blayney Shaw Neville Rd towards Blayney before turning left for the climb onto the Mt Macquarie saddle leading to the mostly gentle descent into Carcoar. The Carcoar Cup is a special category qualifier for the 6ft Track run. 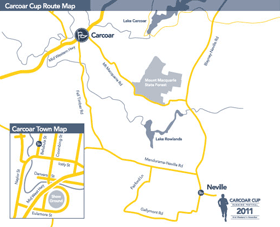 The Carcoar Cup Marathon course has been easily divided into four separate sections for the teams event. The sections vary slightly in distance and difficulty, so allowing for teams combining various strengths, older and younger, and disabled contestants. 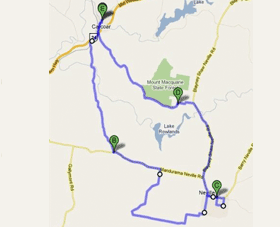 SECTIONS: 10kms, 12.5kms, 8.5kms and 11kms. This makes for a perfect teams event! Prizes: Winning team recieves $600 plus trophy, 2nd $250, 3rd $100. Commemorative Medallions all runners. OPEN: Any combination of four runners. Each runner will tackle ONE SECTION of the course. 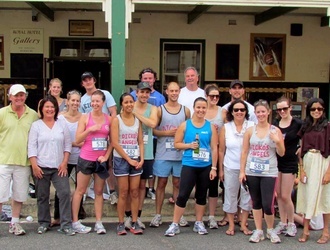 Carcoar Cup’s most exclusive club, where members each run a mile for charity. (For special membership qualifications talk to Andrew, the Mile Long Club President). In 2012 Cadia Gold Runners entered a 26 person team, which ran as honorary members of the Club, alongside other members. The Mile Long Club has raised many thousands of dollars for charity since its inception. Would you like to be part of a team but don’t know where to find the other members? 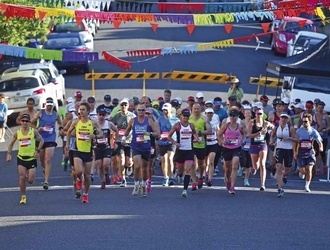 The half marathon begins in NEVILLE and, following the second half of the Carcoar Cup route, makes it way back to CARCOAR over the saddle of Mount Macquarie. At 21 km in length it is a great way to be involved in the festival without having to complete the whole marathon distance… Or use it as training for the Carcoar Cup next year! Actually the most popular race of the Festival! 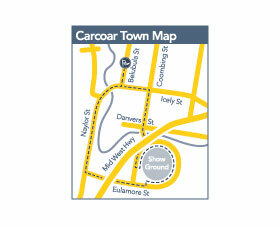 TRANSPORT will leave from Carcoar at 7.30am for those runners who want to leave their cars at the finish. The race will start close to Drink Station #3 on the corner of the Mandurama/Neville Rd and Fell Timber Rd, and runners will run back into Carcoar after the Marathoners have gone through in the other direction. 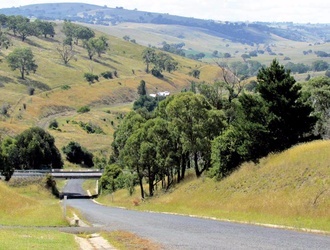 This will be a fast course, starting flat, then a long gradual downhill run to Coombing Creek (7km mark), then uphill for 1.5km and then mainly flat and downhill into Carcoar for the last 1.5kms. TRANSPORT will leave Carcoar at 8.40am for those who want it. Bookings essential as we would like to have a good idea of numbers before race day. 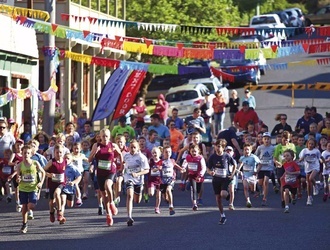 The Carcoar Cup for Kids is a short race around the town of Carcoar designed for the young ones. At approximately 1.8km it is a challenging enough distance for the competitive ones but short enough to still be fun. Some of the older children may fancy running over 6kms in the Dash at 8.45am. Ages are all taken from the date of the Carcoar Cup, so this year the 3rd November. The race starts outside the Courthouse in Icely St, heads east and turns right before the Carcoar school, then the runners pound flat out across Pound Flat (couldn’t resist), across the ford, up and left into the showgrounds; around the showgrounds and out the top gate to Uralba, right along Eulamore St, right again into Naylor St, along Naylor St past all the crowds at the footy ground and over the bridge before swinging left into Belubula St and the FINISH LINE. 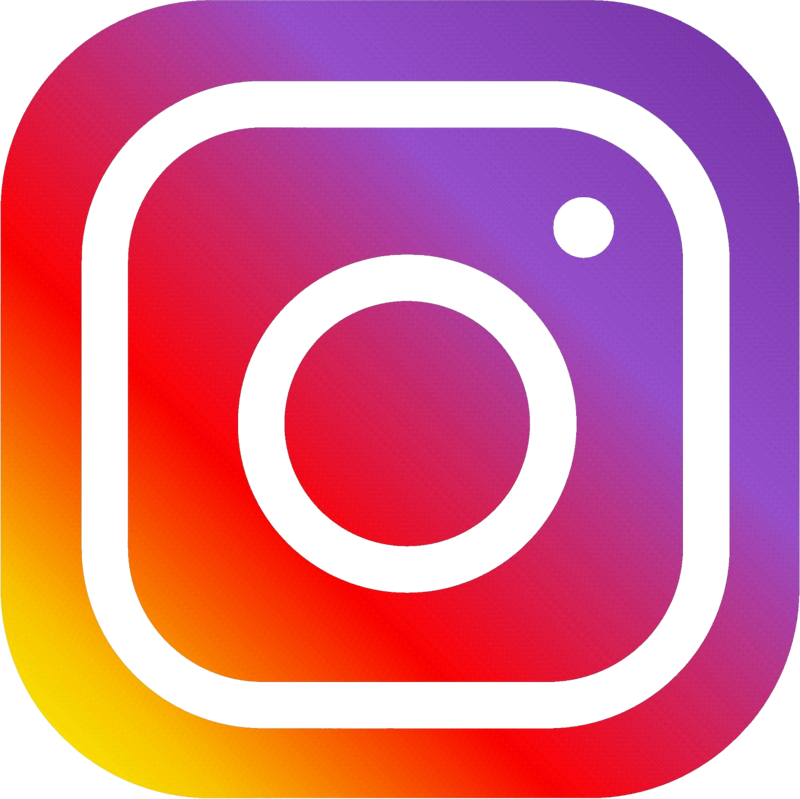 AGES WILL BE TAKEN FROM DECEMBER 31ST 2019, WHICH COVERS ALL CARCOAR CUP EVENTS. First Child in every family $16 entry fee, every subsequent child only $8. 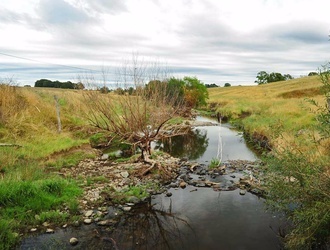 The Carcoar to Creek Dash is a shorter alternative for those who want to be involved in the Festival but for whatever reason don’t want to run the bigger distances. 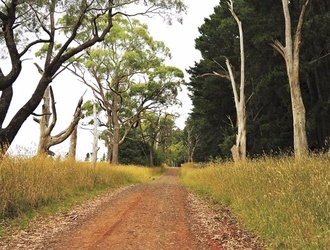 Starting in Carcoar, runners will head up Mount Macquarie, turning Right onto the Fell Timber Road and race down to the Coombing Creek Bridge. 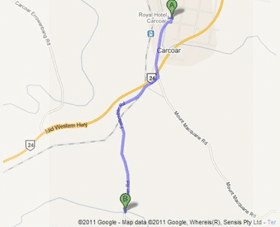 Runners will then turn around and charge back to Carcoar. This run is approximately 6km. Walk the last 10kms of the marathon course at the same time as the last half of the marathon field goes through. You can cheer them on, enjoy the spectacular scenery, and be back in time for the Presentation Ceremony. STARTS 10.00am SUNDAY at the corner of Mt Macquarie Rd and Blayney Shaw Neville Rd. A two-person bike & run combo following the 42km Marathon course. Initially intended for a 2018 launch but now postponed until next year, the Shearer's Race will be a brand new event for the Carcoar Cup, offering even more variety and competitive interest to an already jam-packed race schedule! After being inspired by the classic French short film "Le Rendez Vous" in which a Ferrari races through Paris in the early hours of the morning, we thought we would bring our own event to the attention of enthusiastic runners from all across the country – and the globe! – with a video from our own hot lap. So, after racing many times around this fabulous running course with a camera on board, and following much editing and toil by Louise Purcell, we are proud to present our hottie for your enjoyment! The first weekend in November. In 2019 this will be Saturday the 2nd and Sunday 3rd. What will the Carcoar temperature be like in November? 8° to 22° historically – great conditions for morning running. We encourage everybody to have a go, and be fit enough for the challenge. There are many choices of distance, and as all profits go to charity, please give it a go! Suitable attire, hat, sunscreen – drink stations every 4kms with water at all stations and ‘sports drinks’ available at every station. What happens if I hurt myself? Rural Fire Service first aid specialists will be on hand all weekend to administer first aid to both runners and spectators as and when it should be needed. 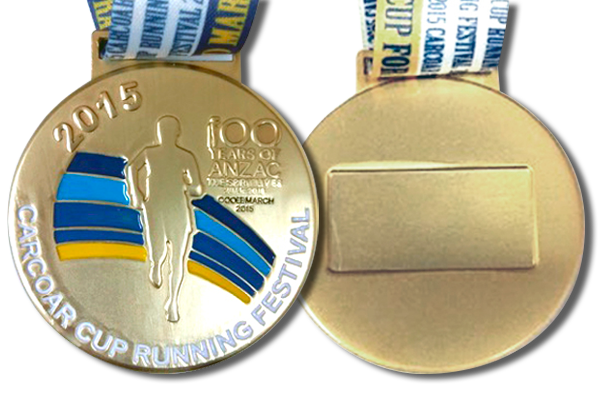 Race entry, a commemorative Carcoar Cup medallion & ribbon, plus trophy and prize money if you win or run a place! 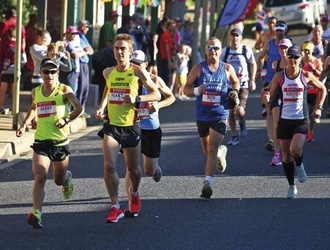 Automatic entry for 2019 marathoners, half marathoners & 10K special runners in the NSW Regional Distance Running Championships. Bitumen, dirt, hills, dales, some steep bits, some flat bits, fantastic scenery, the town of Neville, Mount Macquarie and the town of Carcoar. 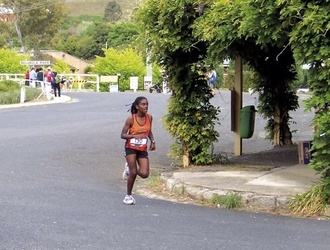 Entrants will race anticlockwise on a circular course – an almost equal mixture of bitumen and dirt roads, with rises and falls of several hundreds of metres in altitude. Watch our Virtual Tour in the panel above. 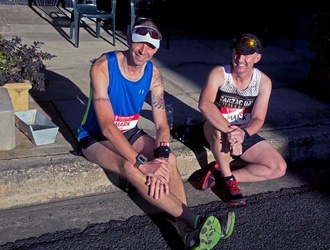 The Carcoar Cup is now a truly iconic event on the Australian Running Calendar. It has been awarded Community Event of the Year in 2011, NSW Regional Flagship Event 2014, 2105, 2016, and NSW Flagship event for 2017, 2018, 2019. It is a family event with a race for all ages and abilities, but the $13,000 in prizemony makes it the richest regional event in NSW. 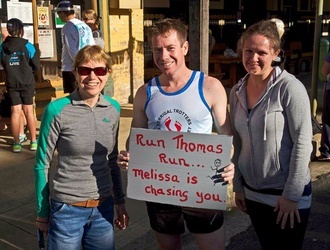 It attracts runners from all over Australia and overseas. Everybody should experience Carcoar Cup. 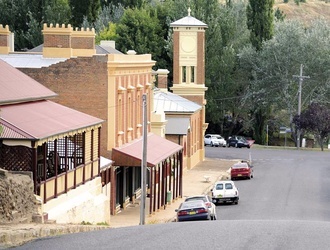 Bib Collection is at the historic Carcoar Court House on Saturday 2nd November between 12.00 midday & 5.00pm (preferred) or on Sunday 3rd November (Race Day) between 6.00am & 7.45am. If you are arriving on Sunday, please be there at least 30 minutes before your race to register. We welcome last minute entries UP UNTIL 5.00pm on Saturday 2nd November. We always have lots of question re drink stations, so here it is from the horse’s mouth. Drink Stations are manned by fabulous, very friendly volunteers, which is part of the great attraction of the Carcoar Cup, so spread the love! All stations have water and Powerade, along with jelly beans and snakes. DS7 – 3kms – more great Nevillites. DS8 – 3kms last of the Neville contingent with Rob in charge I think!! DS9 – 4.5kms – the best drink station as it is right at the top of that hill! DS10 – 5kms – Home pretty much all downhill from DS9, so we would hate to force you to stop at a DS. Half Marathon DS6 ×2, DS7, 8, 9, 10 – see distances above. DS10 has everything, and you can get a free massage in the fabulous PhysX bus at the finish line. Tours of the Carcoar Cup Course on minibus. Leaving approximately on the hour from 12pm at the Courthouse, depending on demand. Bookings taken as well as tickets available at the bus. Carcoar Pottery Exhibition of specially commissioned trophies for the Carcoar Cup. Available at the Village Grocer, Royal Hotel Carcoar, Teapots Cafe, and the Neville Hotel. Carcoar Cup Pasta Night at the Carcoar School of Arts. $25 for adults and $15 for Kids (Under 12). Please book with Andrew on (02) 6367 3290. 6.00pm Royal Hotel Char-grill and Bistro, Carcoar. Counter meals available from 6.00pm at the Neville Hotel. Sausage/steak sizzles, local shops, food & coffee carts. 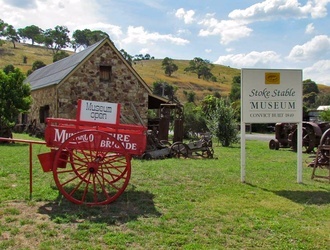 Carcoar is a great location, being only 3 hours from Sydney. The major regional centres of Orange, Bathurst, Cowra & Canowindra are all mere half hour away, while the Historic Villages of Millthorpe, Blayney, Neville, Mandurama & Lyndhurst are all within 20 minutes drive. Some of the most popular accommodation options are linked to below. Are you having trouble finding accommodation for this years Carcoar Cup? Contact Andrew on 0412 265 344 for local knowledge. Thanks for a fantastic event Carcoar Cup Running Festival. Great event- thanks for organising for me while I was in the country. Your run is always welcoming and friendly and cosy and encouraging and happy and hilly and fun!! It really has a great atmosphere to it!! What a fantastic day out. Thank you Andrew and Jane for putting together such a fabulous event in a stunning location. I’ve been talking about coming for a few years now and it was certainly worth the wait. Your team of volunteers are amazing, so enthusiastic and made us feel so welcome. The course is such a challenge and the views are amazing. Can’t wait to come back!! Thank you so much Andrew and a special thanks to your great staff!! This may be a small event but none other can match the great enthusiasm and genuine friendliness that I found there. I wish I could be there every year! We had such a short stay but leave with a lifetime of great memories! The Carcoar Cup 2016 was a wonderful event! Over 40 students from St Joseph’s participated and had a fantastic morning running, walking, skipping and twirling around the Carcoar Cup course. We even had four students take on the gruelling 6km Carcoar to Creek Dash! This has become a fantastic tradition at our school and we are already looking forward to 2017. Had a wonderful time! Was our first and loved it! Thanks Andrew and Co. for an amazing Carcoar Cup. Myself and my awesome team “Will Run For Champa’s” had an absolute ball. I loved the team Marathon. And the atmosphere was fantastic. You should be so proud of such an incredible event. This was my first Carcoar Cup and certainly won’t be my last. Thank you! What an amazing experience! This was my first ultra marathon, it was everything I was expecting and more! Met some amazing people, learnt a lot about what happens beyond the marathon distance. It was hard but loved every minute of it. Thanks again for such a great event. Lovely atmosphere and scenery. Also happy I got a Carcoar Pottery boxer dog mug and it made my day running across the finish line with my dog-ruby! See you next year! Thank you Carcoar Cup. Amazing event! I can’t say I’ve ever seen so much heart and soul in an event crew. To see that you genuinely love putting the event on for us is very special. Take a bow folks – you were magnificent! Thank you Andrew and your amazing organisation team, the RFS, everyone at drink stations. This run was rumoured to be the hardest and it was, but it had the best volunteers. See you next year! It is always a wonderful weekend. Super organised race with super friendly and helpful volunteers. Thank you so much for everything you do to make it a really enjoyable day. That was an awesome weekend…even with the hills! Thanks to all involved, especially all the vollies for sitting out there all day in that wind. You are all awesome. See you next year. Thanks so much to everyone who helps put together a great event year after year, you make it a joy to participate in the day! Thank you for such a great event and to everyone on the team helping making this happen. A job well done. It’s a great event. Thanks so much everyone. Had a great time running the half with friends and meeting new friends. MioTime: Commemorate your run and keep a record of times & distances ... right on your medallion! When you purchase a MioTime medal plate, it will be automatically linked to your entry. After you have run your event, your Miotime plate will be engraved with your name, time and the event, then posted to you. Simply peel off the adhesive backing and locate your MiotTime within the indentation on the rear of your medal. Finally, peel off the protective film to see your achievement commemorated forever. Pasta Night: Please book online using the merchandise ordering section below.